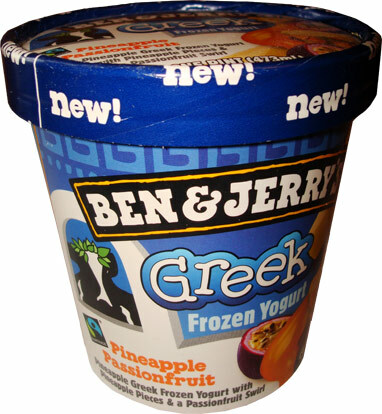 [By Nick, 2013-2014] Seeing as Dubba reviewed the only new Greek frozen yogurt flavor from Ben & Jerry’s that sounded palatable to me, I guess I’m stuck reviewing their Pineapple Passionfruit flavor. I’m not going to lie, this flavor terrifies me. 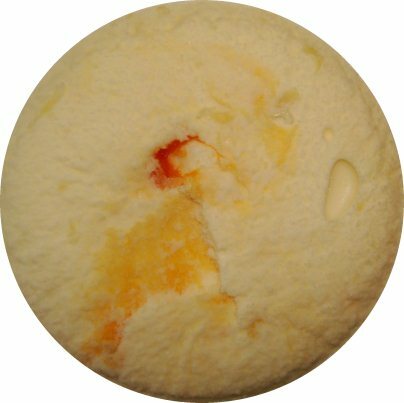 I’m a fan of pineapples and have enjoyed a nice Dole Whip on occasion but the passionfruit swirl makes my stomach churn. I’ve only experienced the taste of passionfruit once through one of Chobani’s Greek yogurts. Let’s just say I took a spoonful of it and threw it out immediately. Yeah, it was that vile. I did manage to build up the courage to try Liz Lemon but I’m not so sure if I have the courage for this one quite yet. My friend Eric (aka Junk Food Guy) did give this one a very positive review, as did Marvo, so here’s hoping my original experience with passionfruit was just a fluke. Bah, I can already see the passionfruit swirl. Is it too late to turn back now? I’m just going to try some of the base first. Hmm, it’s really restrained for pineapple. I normally would say it tastes “tropical” but I’m not getting much of that vibe. It’s just a very mellow pineapple flavor. Oh wait, I found a pineapple chunk before I hit the swirl still. Once again, the flavor is really mellow. It doesn’t even scream pineapple as I had hoped it would. I’m surprised the chunk isn’t icy at all though. It’s just as if you grabbed some chilled pineapple from your refrigerator. Now I guess I have to try the passionfruit swirl don’t I? Oh man, my first experience wasn't a fluke. This stuff is beyond disgusting. Blech, I need mouthwash or something. I can’t even describe the flavor, it’s just gross. The flavor dominates the pineapple and I can’t even taste the base anymore. That’s a shame because I actually was enjoying the pleasant pineapple flavor but the passionfruit just ruins everything. 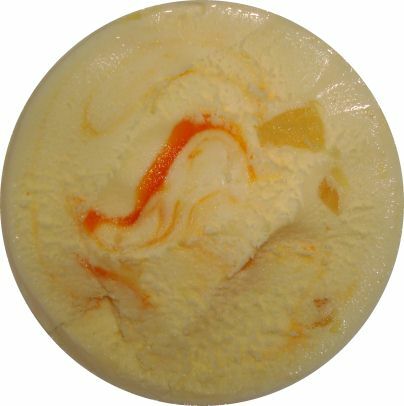 Even if I try scooping around the swirl all I can taste is that passionfruit funk. I think my taste buds hate me again. I’m sure if you’re a fan of passionfruit like Eric then you’ll enjoy this flavor. If you don’t like passionfruit like me, or you are a skeptic, I’d recommend that you stay away from this one. so disagree, I found it creamy lovely refreshing and addictive, absolutely loved, loved, loved it!!! I'm so upset that they no longer make this flavor. I was completely addicted.it was yummilicious!